Compare the different STYLES of each artist, especially with grades 2-5. Point out that the paintings looking the most realistic, like a photograph, are the result of the artist carefully blending COLORS, to highlight and shade objects. These two-dimensional objects appear to have thickness and depth so they fool our eyes into believing that they are three-dimensional and realistic. Highlights are areas where the light is reflected off an object. An artist blends white into an area (TINT) so that it seems brighter. Shading happens when an object is overlapped or blocked from light and a shadow is cast. An artist SHADES by blending a darker color into an area where the shadow would be. Highlight and Shading makes SHAPES appear less flat. Have the class look for examples of highlight and shading in some of the paintings. Ask if they can see which side of the picture the light is coming from. A Tints and Shades painting project would work well with this packet. Pierre Bonnard has painted his picture using mostly flat COLORS, without much realistic shade or highlight. The LINES on the tablecloth are not carefully painted and the flowers are hard to individually recognize. Bonnard was not worried about creating REALISM. We still recognize what he was painted but it does not resemble a photograph at all. Bonnard created an EXPRESSIONISTIC Still Life. He was more interested in creating a feeling or MOOD with his painting, than a realistic copy. 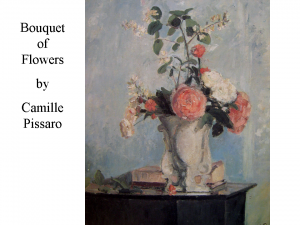 Define IMPRESSIONISM for third, fourth and fifth grade students. Define REALISM and EXPRESSIONISM for all students. Be sure ALL 6 pictures are returned to the Packet Carrier after your Presentation is finished. There are many different types of paintings. Some of these are Landscapes, Seascapes, Portraits, Narrative (pictures that tell stories), and Still Life. A Still Life is an arrangement of objects (usually on a table) that an artist paints a picture of. In general, almost any object can be included in a Still Life, as long as it is inanimate (nonliving) and small enough to fit on a table. Usually, a Still Life is set indoors and contains at least one man-made object, such as a vase or bowl. David Drummond is a former physicist. He says his work with optics, rainbows and prisms has enhanced his painting because he understands lights and colors and how they bounce around. Some of those bouncing lights and colors can be seen in the hints of pastel in the “white” tablecloth and in the hint of orange, reflected in the shadow of an orange slice. This is how David Drummond feels about his art: “I’d like to learn to catch everything that fascinates me and put it one paper. Each time I paint a picture, I feel as though I’ve captured a little bit of something and made it my own”. David Drummond feels, “The challenge of a Still Life is to get it all just right.” The artist refers to the crisp TEXTURE of a linen napkin, the faint printing on an orange, the reflected COLOR on the handle of a knife, the suffusion of light and the subtlety of shadow–these are among the details this artist has gotten “just right” in his Sunkist painting. David also paints people (Portraits) and Landscapes (outdoor scenes). He explains that models get tired and the natural light in Landscapes changes quickly–so an artist’s achievement with those subjects may be restricted by time. But with Still Life, the artist controls the time available to capture details, TEXTURE, and gradations of light. Point out how the viewer can see the edge of the table, under the tablecloth (in the FOREGROUND). How was the artist able to help us see this? By adding shading to the white. The whole tablecloth is white but the section that hangs over the table is a little darker SHADE of white. The edge of the table under the tablecloth is a narrow band that is still a darker SHADE of white. The eyelet openings in the cloth, below the table, do not have dark centers, which makes it seem that there is empty space under the table edge. Can you find the lacy corner of the napkin? Notice how the white napkin also has many shadows, which allow it to show up against the white tablecloth. ☺ Bring in some oranges so the class can examine the TEXTURE and COLOR of the skins. Point out the way the navel sometimes has green and/or light yellow around it. Compare the oranges to the painting. Cut an orange open and have the class look at a thin slice, with a strong light source behind it (lamp or sunny window). Ask the class if they think the artist did a good job of showing light passing through the orange slice, in his painting, as they compare it with the real thing. Draw the RADIAL design of an orange cut in half, and/or the side view of an orange slice. Paint the drawing with watercolor. Try to leave small areas of white highlight and very light COLOR to achieve a sense of light shining through. 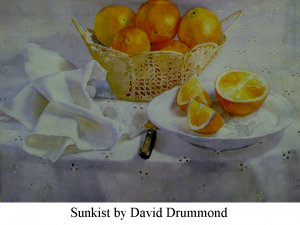 Of course, you will need to eat the orange after you are finished–just like David Drummond did when he painted his picture! Pierre Bonnard was born not far from Paris, in 1867. He was a law student at first, who later decided to study painting. Bonnard attended the Academie Julian for his formal art training. His earliest works were theatrical sets, furniture decorations, screens and posters. Bonnard regularly contributed artwork to La Revue Blanche, a periodical magazine, and he created illustrations for many books. By 1898, at his first exhibition, it was clear that Bonnard was the painter who could bring magic to the simplest things in life, like bathtubs, children, gardens, the sea and women. He was considered a painter constantly delighted by the most ordinary objects and actions, to which he brought a constant freshness when painting them. Bonnard liked the bright colors of the Impressionist painters but he did not like all the aspects of their style of painting. Even as an old man, Pierre Bonnard was known to paint with the same joy and excitement that he had painted with when he was young. Bonnard died in 1947, at the age of 80. What type of container holds this bouquet? A pitcher. It seems ceramic, with some type of design painted on it. The design seems blurry or out of focus, in fact, the entire painting seems out of focus. What kinds of flowers are in this bouquet? It is hard to identify the individual flowers. They appear more as blobs of color rather than flower SHAPES. Can anyone find the flower that has fallen out of the bouquet? (Have 4th and 5th graders use words to describe where this is, instead of pointing to it.) This flower is laying on the right side of the pitcher, above the signature of the artist. How many of you think that you could paint a picture like this? Point out that the artist was not careful to make his Still Life appear REALISTIC. He was more interested in capturing a MOOD with this picture–it is EXPRESSIONISTIC. We can see that it is a Still Life with a bouquet of flowers but the artist was not worried about being careful with the details. Bring in a flower arrangement in a pitcher that is similar this one. Put a patterned tablecloth underneath the bouquet and have the class draw and paint this Still Life scene. Create a Still Life drawing using oil pastels. Pastels are a medium that many kids never get to try. Instruct the class to make sure that they cover the ENTIRE paper with some type of picture, pattern or background color. Paint a tablecloth PATTERN on an entire sheet of paper. 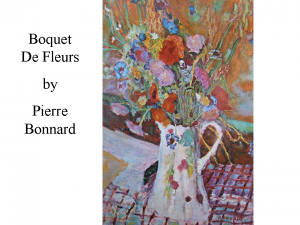 Choose a PATTERN similar to Bonnard’s or completely different. If it is a polka-dot tablecloth, be sure the dots are in an ordered PATTERN. Bring in several samples of cloth PATTERNS. When the page is dry, cut out a flower arrangement from colored paper and glue this on your painted background. James Peale was the youngest brother of the well-known Colonial painter, Charles Willson Peale. James was born in Chestertown, Maryland, in 1749. As a young man, James learned and practiced the trades of saddlery, carpentry and cabinet making. James did not decide to become a painter until 1770, when he was about 21. This was when he began taking watercolor and oil painting lessons from his brother, Charles, who had studied painting in London. James Peale was a Captain in the Revolutionary Continental Army. In 1779, James resigned his commission and returned to his brother’s home in Philadelphia. The careers of the two brothers were then closely linked and James assisted Charles, not only in painting, but also with the natural history museum that the older brother had founded, and in which he used paintings as backgrounds to display museum objects. One result of the museum was that Charles Willson Peale taught his own son Raphaelle, his brother James, and James’ four daughters, to paint Still Life in the style that became known as the Peale manner. The composition of this style of Still Life painting was typically a life-like and careful arrangement of fruit in a bowl, placed on a table, against a plain wall. In October 1786, the brothers decided to divide their painting business. James became the specialist in painting miniatures. He also painted Landscapes, Historical subjects and small Portraits. In 1818, James Peale’s eyesight failed and he began to specialize in Still Life painting. James was noted for painting realistic Still Life pictures, which presented ordinary objects, with plain backgrounds that were very effectively brightened with shadows and highlights. In those days before cameras, James Peale’s Still Life paintings were about as close to the real thing as anyone could find! Display all of the Still Life paintings at the front of the room. Explain what a Still Life painting is. Compare the styles of painting by each artist. Point out the way James Peale has painted his apples with even their realistic blemishes. Bring in a nice bowl, grapes, apples, a pear and a piece of grapevine. (You should be able to find all of these in silk, at Wal-Mart or a craft store.) 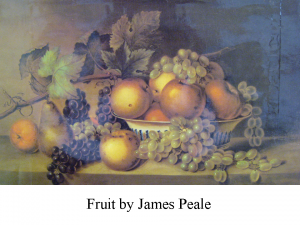 Arrange these items on a table in a way that resembles “the Peale manner” of this painting–a careful arrangement of fruit in a bowl, placed on a table, against a wall. After discussing the different STYLES of each of these artists, assign the class to paint your arrangement IN THEIR OWN STYLE! Explain that they could choose the somewhat messy style of Bonnard, or the darkly outlined, overly geometric and undetailed Style of Cézanne. Some might use watercolor, some thicker tempera, and some crayon or felt pen. Some artist may just want to sketch with pencil. Discuss how changing the natural color of the fruit might change the look and MOOD of a Still Life picture. They might use dark COLOR or bright COLOR. They could even change the COLOR–how about orange grapes or blue apples? What about fluorescent fruits or fruit in SHADES of gray, white and black? The fruit could be sketched in a realistic style or the apples and grapes could become square to create an expressionistic style. What about triangle grapes—that would be modern! An artist could create an Expressionistic Still Life with PATTERN—What about pink and purple polka-dot grapevine leaves, or checkered apples or pears? How about cutting the fruit SHAPES from patterned wrapping paper or wallpaper? Tearing the SHAPES (including the bowl) from construction paper, then gluing to a PATTERNED background? Stress the importance of creating their own unique STYLE of Still Life composition. Jean Baptiste Simeon Chardin was born in Paris, on November 2, 1699. Chardin was the son of a Master Cabinetmaker. He began his art career as a student, restoring paintings at Fontainebleau. Chardin attracted attention to himself by his painting of a surgeon’s sign, which was decorated with a lively street scene, instead of the usual symbols most sign painters of his day used. People like his creative sign and in the 1700’s, sign painters were not usually that uniquely creative! Jean Chardin began to paint Still Life paintings that were very well liked by people. From Still Life paintings he went on to a series of singeries (Paintings of monkeys dressed as people, doing human activities.) Then he began painting genre (jon-ruh) pictures showing middle-class French life. Chardin’s paintings sold well but he didn’t get much money for them. 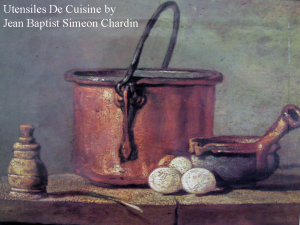 Chardin’s work was very different from the traditional artists of his day. He felt that anything was worth being painted. Most other artists were more interested in painting important or powerful people, scenes depicting stories from history or great battles. These types of paintings were considered the “proper” things to paint and could make an artist famous. Ordinary objects were generally not considered worth an artist’s time. Instead, Chardin chose simple objects and simple scenes instead. Many artists of his day would have thought it foolish for an artist to waste time painting a copper pot, some eggs and crockery. Chardin was truly an artist ahead of his time. He looked at things with a creative eye. He was able to see beauty and inspiration in an old dented cooking pot and a few chicken eggs! Jean Chardin became a member of the Royal Academy of Painters in 1728, one of its Counselors in 1743, and was its Treasurer in 1755. As Chardin’s eyesight began to fail in his old age, he turned to pastels a few years before his death, in 1779, at the age of 80. What do you think makes this pot look so realistic, like a photograph? The artist included the dented imperfections of a well-used copper pot. The reflected light tells us it is metallic. Where is the light coming from in this scene? From the left The right side of the copper pot, and the crockery is shadowed. Do you think the eggs are as realistic looking as the pot and the crockery? Bring in some interesting copper or stainless steel cookware. Have the class examine how the metal catches and reflects the light. Draw the SHAPE of the pan or pot with a pencil. Shade around the reflections on the metal, using the side of a pencil. Bring in a basket or bowl of eggs. Eggs have an easy SHAPE for even the youngest grades to draw. The container should have an interesting COLOR, SHAPE or PATTERN that will give the class a challenge to design. Point out the way the oval SHAPES overlap and change as they are grouped together in the bowl or basket. Discuss how the overlapping egg(s) is (are) the one(s) closest to the viewer, covering up all, or part, of the eggs behind (Grades 2-5). If you have some crockery with an interesting design, use it in a Still Life arrangement with a few other kitchen objects. A large, slotted spoon has many simple and interesting SHAPES to draw. Many salt and peppershakers have simple SHAPES that most kids could easily draw. Break an egg (or two) on a table or a plate and have kids draw and paint the broken shell pieces, along with the spilled contents. This will really get their attention because it seems like such a naughty thing for a grown up to do! Paul Cézanne was born in France on January 19, 1839. His father was a banker, who wanted his son to study law. Paul studied law, from 1859 to early 1861, because it was what his father wanted. Reluctantly, His father was persuaded to let Paul try a career in painting. Paul’s father gave him a small allowance to live on while he was studying art in Paris. Cézanne met many artists while he was in Paris, however, he failed the entrance exam at the Beaux-Arts Academy and returned home, discouraged. But Paul was determined to become a painter and, at age 23, he returned to Paris. For awhile, Paul worked very closely with some of the major Impressionist painters of his day—Manet, Renoir and Degas. When Cézanne was thirty-two he began to develop his own theory of painting and his own style. He decided to reduce natural objects to their basic geometric SHAPES—the cube, cylinder and cone. By 1890, Cézanne’s father had died and Paul inherited a large fortune. Cézanne was now financially independent, although he was not yet a successful painter. Paul had not been able to make a living as a painter because the public (at that time) did not really like his new painting style. Paul’s work was not even accepted by the Paris Salon until he was 43. His ideas about painting were very different and Paul was a very shy and modest man. He was often hurt by the laughter his art provoked. It was not until 1895 that Paul began to get the recognition he deserved for his revolutionary ideas in painting. In 1900, Paul Cézanne’s works earned high acclaim at the Universal Exposition, in Paris. This Exposition is considered the beginning of Modern Art. Cézanne’s experiments with COLOR, LINE and SHAPE helped form important artistic developments of the 20th century. 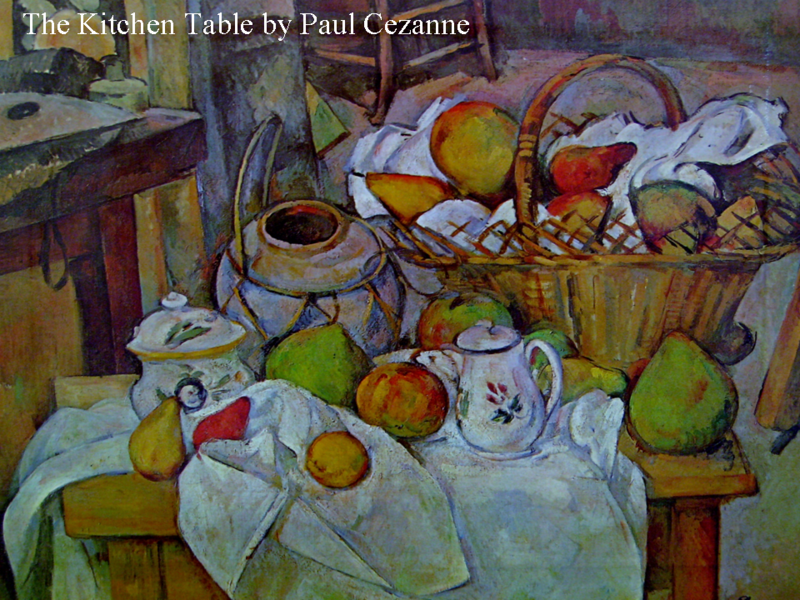 Paul Cézanne has been called the very first modern artist. Cézanne was determined to die painting and he did. Seven days before his death, out on a painting trip, he was caught in a major rainstorm and had to be brought home in a farm cart. He recovered enough to go out into his garden to paint again and died at his easel, in October of 1906. Cézanne was more interested in the SHAPES of things. His paintings didn’t look much like the real thing that he was painting. In the time before photography was common, people preferred to have their paintings look more like a photograph—REALISTIC. Paul loved to exaggerate the geometric SHAPE of natural things. At first people thought Paul did this because he could not paint very well but Cézanne just did not want to rely on the old ways of painting. He wanted his paintings to make people aware of how SHAPES fit together or contrasted with one another. Paul wanted people to see his Still Life as something more than what they could see with their own eyes. He painted a view of the scene that most people could never see with their own eyes. Cézanne was very particular with his painting. He planned his designs very carefully and none of his work was the result of an accident. Paul painted and repainted, altered brush strokes, arranged and rearranged, made many, many sketches and drawings, propped up fruits and tilted bottles and baskets. In his Still Life, Cézanne captured a moment in time that he deliberately chose and very carefully designed and set up. Point out the exaggerated GEOMETRIC SHAPE that is brought out in this Still Life—the roundness of pottery and the fruit, the large triangle shapes and the rectangle shapes. Look for the triangles Paul hid in the very center of this arrangement. You will need to connect three pears with an invisible line. Can you find one or mote than one of these? SHAPES like these give the illusion of three-dimensional FORM. Camille Pissaro was born on St. Thomas, in the Virgin Islands, in 1830. Camille went to Paris at the age of twenty-five, to study art. Pissaro was a painter of nature. He was only happy in the countryside, so he and his family settled there in 1866. There he met and worked with Paul Cézanne, and stayed until 1871, when he and the artist Claude Monet fled to England, to escape the German invasion of France during the Franco-Prussian War. When Pissaro returned to his home in France, after the war, he found that it had been ransacked and more than a thousand of his painted canvases had been destroyed by invading soldiers. Pissaro was the oldest of the Impressionist painters and the only artist who participated in all eight of the Impressionist exhibits. Like many of the Impressionist painters, Pissaro liked to use thick paint and often painted with a palette knife instead of a paintbrush. Camille Pissaro died in 1903, at the age of 73. What do you see in the background and on the right side of the picture? The artist has painted a blue wall with flecks of light. The wall is not the same shade all over, because the artist has blended white and blue to create various blue TINTS. Can anyone find the curtain? On the right side of the painting, he has painted the impression of a sheer white curtain. Pissaro often liked to paint with thick paint and a palette knife, instead of a paintbrush. Mix wheat paste, (available at craft stores) or powdered laundry soap, with tempera paint to create a thicker paint. 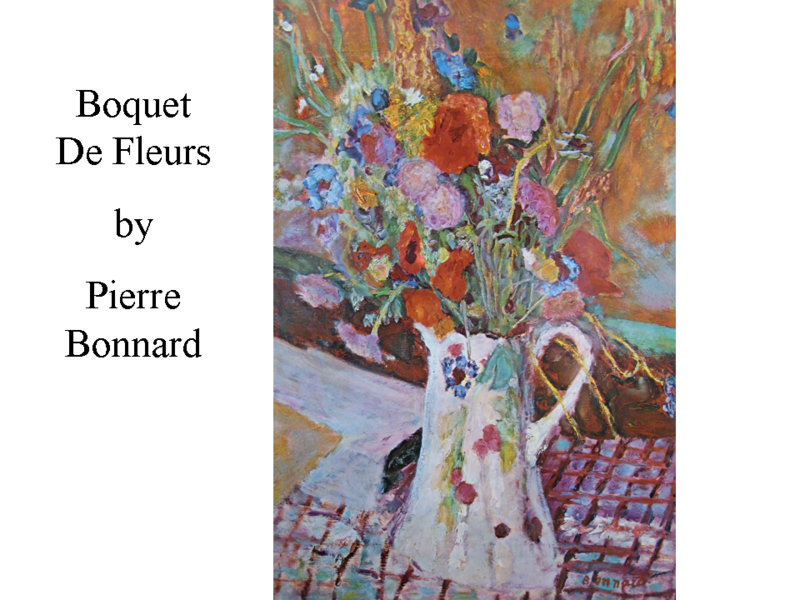 Use craft sticks (like a palette knife) to create a Still Life of a vase with flowers. Do NOT use a paintbrush. You could set books beside the vase, to create a more interesting arrangement. Use real or silk flowers. Paint a background first, which shows light reflecting from the window, like the wall in this picture. Give kids one color of tempera paint and some white paint, on a paper plate or palette. Use a small piece of sponge to paint and blend the color with white in different areas of the wall background. Be sure to point out how the wall, behind the base, is a darker blue because the vase and the flowers are shading the wall. Notice the dabs of white in the background wall and the lighter tints of blue, which you can create in your own project by blending the COLOR and the white with the sponge. After the background is dry, paint a vase with flowers. The base needs to be in front of the shadow you created on the wall background but don’t paint the flowers and base too large to make sure that the shadow will show. Paint a background (see above). When it is dry, cut flowers and a vase, from colored tissue paper, and glue it to the background.